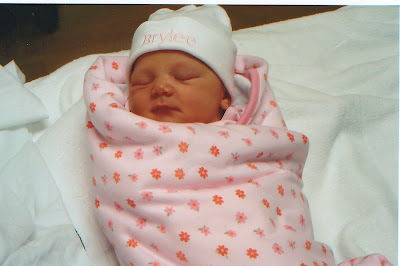 5 years ago today God blessed our family with the most beautiful baby girl! It is so hard for me to believe it has been 5 years... what is it about 5 that seems so BIG and so OLD! How can my baby be 5 years old? Brylee we thank God for you every day and we are so thankfully to have a priss pot girly girl just like YOU! I hope you always know how special you are to our family and how much we love you! We hope you have the best birthday ever! In honor of your birthday here are 5 "girly"things I love about you... 1. I love that pink and lime green are your favorite colors. 2. I love that you ask to go shopping with "the gurls" all the time (your GoGo loves that too) and you are the BEST little shopper. 3. I love that you want to wear fun shoes, flip flops, yellow box shoes, boots, polka doted shoes; all shoes that are NOT tennis shoes! 4. I love that you like to wear cute girly clothes especially Mrs. Ashley clothes, skirts, tights, and dresses... and your favorite clothes are the ones with your name or initial(s) on them. 5. I love that you always want to wear a hair bow or ribbon in your hair... even to sleep, swim, and the one season you played ball. Check back later tonight for pictures from our birthday breakfast; family birthday party; and brylee's first "date"!